20% Off Orders of $40+ [Exp. 06/29/19]. 25% Off Orders of $40+ [Exp. 04/16]. 20% Off $40 or 15% Off $20 [Exp. 04/08/19]. 15% Off $20 Or 25% Off $40+ [Exp. 04/02]. 15% off $20, 20% off $40, 30% Off $60 [Exp. 03/04]. 15% off $20 or 25% Off $40 [Exp. 02/18]. 25% Off $40+ [Exp. 10/29]. 25% Off $40+ [Exp. 10/09]. Extra 25% Off $40+ Order [Exp. 09/04]. Extra 25% Off $40+ Order [Exp. 08/24]. 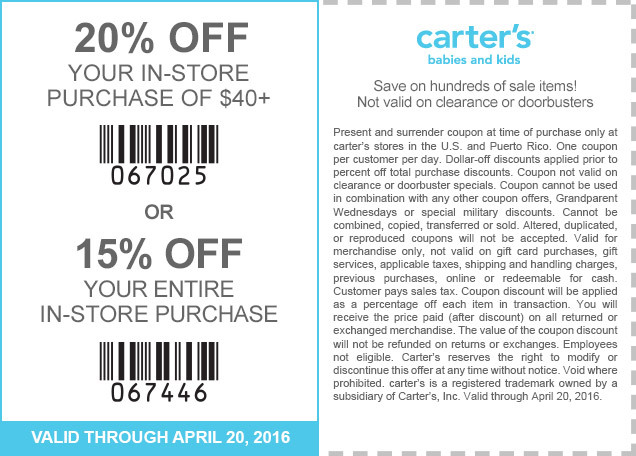 15% off $20 or 20% Off Your $40 Purchase [Exp. 08/20]. Extra 20% Off $50+ Order [Exp. 08/06]. Extra 20% Off Your $40 Purchase. 15% Off $20 Or 25% Off $40 [Exp. 03/12]. 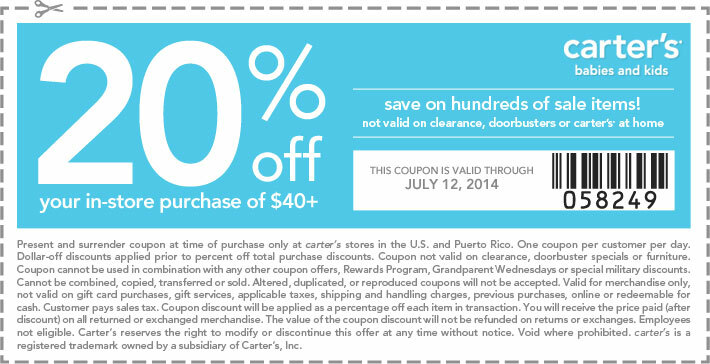 Extra 25% Off Purchase of $40+ [Exp. 03/05/18]. 30% off $60+ [Exp. 03/05]. 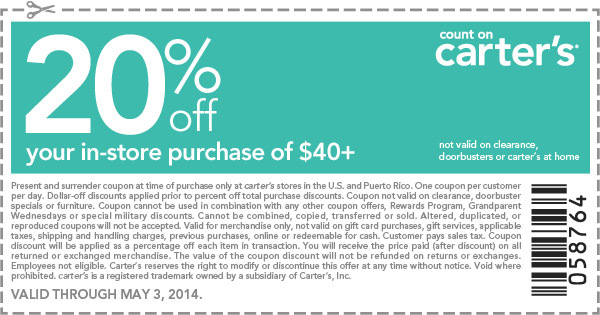 Extra 25% Off Your $40 Purchase [Exp. 02/20]. 25% Off Your Purchase of $40+ [Exp. 02/11/18]. Extra 20% Off $40+ [Exp. 01/31/18]. Extra 20% Off $40+ [Exp. 01/15/18]. Extra 20% Off $40+ [Exp. 01/09/18]. Extra 25% Off $50+ [Exp. 12/24]. Extra 25% Off $40+ [Exp. 12/10]. Extra 25% Off $40+ [Exp. 11/16]. Extra 25% Off $40+ [Exp. 11/08]. Extra 20% Off $40+ [Exp. 11/08]. 50% Off Entire Site + 20% Off $40 Or More [Exp. 08/31]. 20% Off $40+ [Exp. 08/31]. 20% Off $40+ [Exp. 06/30]. 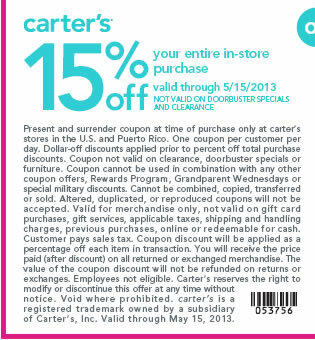 15% Off Entire Order or 20% Off $40+ In-store Printable Coupon [Exp. 06/20] on everything. Extra 25% Off $40+ Purchase [Exp. 05/06]. Extra 25% Off $40+ Purchase [Exp. 04/17]. 50% Off Sitewide + Extra 25% Off $40 [Exp. 03/27] on everything. 50% Off Sitewide + Extra 20% Off $40 [Exp. 03/27] on everything. 15% off Any Order or 25% off $40+ [Exp. 03/21]. Extra 25% off $40+ [Exp. 03/06]. 20% Off Your Purchase Of $40+ [Exp. 02/28]. 15% Off Your Purchase Of $20+ [Exp. 02/28]. 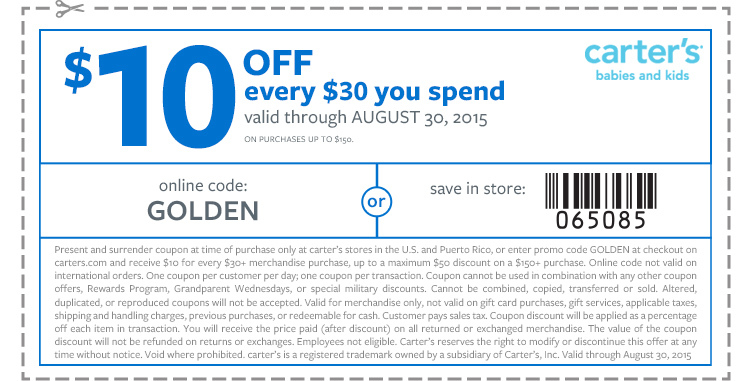 20% Off Your Purchase Of $30+ [Exp. 02/28]. 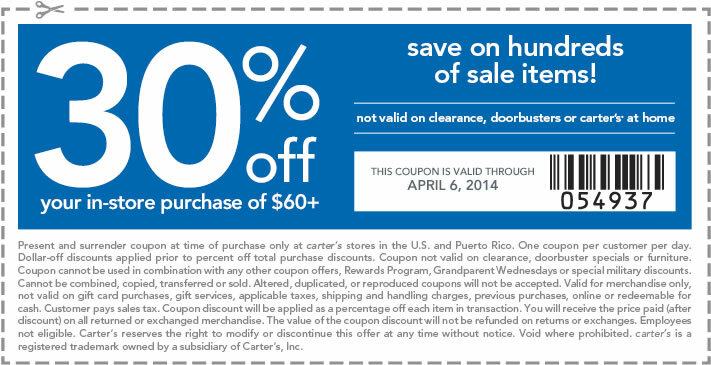 50% Off Sitewide Plus extra 25% off $50 [Exp. 02/21] on everything. 20% Off Your Purchase Of $40+ [Exp. 01/31/17]. 20% Off Your Purchase Of $40+ [Exp. 01/07/17]. 15% Off Any Purchase or 25% Off $40 + Free Shipping [Exp. 12/05] on everything, and free shipping..
15% Off Any Purchase or 25% Off $40 + Free Shipping [Exp. 11/30] on everything, and free shipping..
15% off Entire Purchase or 25% off $50 [Exp. 10/24] on everything. 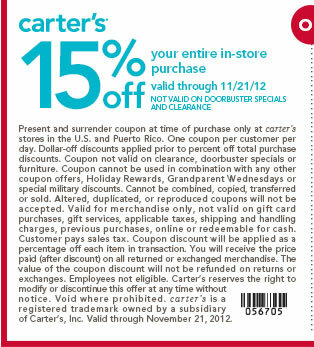 Extra 15% Off Entire Purchase Or 20% Off $40 [Exp. 10/10] on everything. 25% Off Your Purchase Of $40+ [Exp. 08/28]. 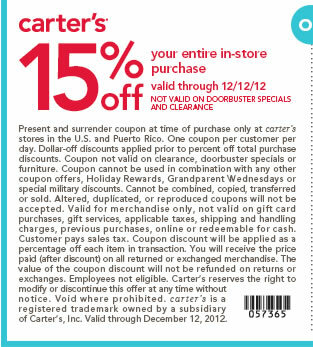 15% Off Your Purchase or 25% off $50+ [Exp. 08/22]. 15% Off Your Purchase or 20% off $50+ [Exp. 07/25]. 20% Off Your Purchase Of $40+ [Exp. 06/30]. 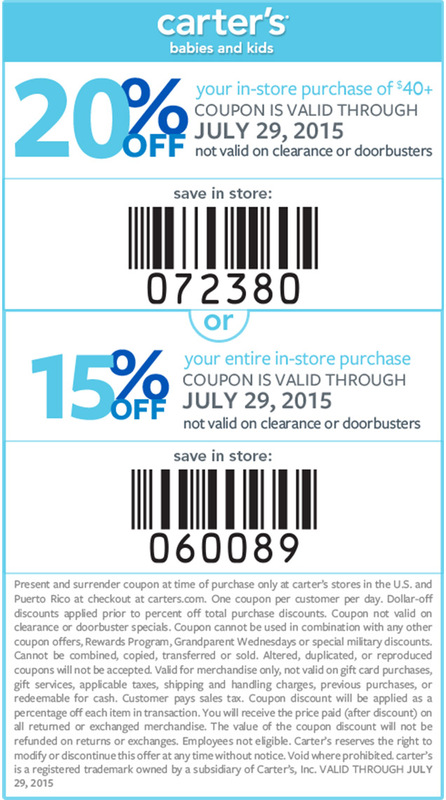 15% off Entire Purchase or 20% off $40 In-store Printable Coupon [Exp. 06/01] on everything. 25% Off $40+ [Exp. 05/11]. 50% Off Sitewide + 25% Off $30 or More [Exp. 04/30] on everything. 20% Off $40 on everything. 50% Entire Site & Store + 15% off No Minimum or 20% off $40 [Exp. 03/21]. 15% Off Sitewide or 25% Off $40 [Exp. 03/07] on everything. 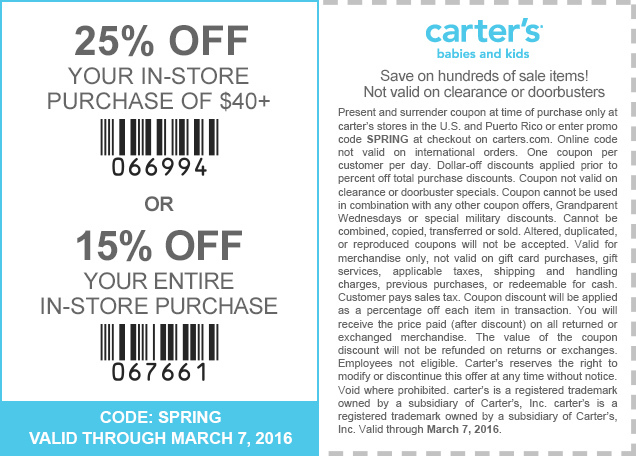 15% Off Entire Purchase Or 25% Off $40 Or More [Exp. 12/21] on everything. 15% Off Everything or 20% Off $40. Up to 50% OFF Sitewide + Extra 25% OFF $50. Up to 50% OFF Sitewide + 20% OFF $40. 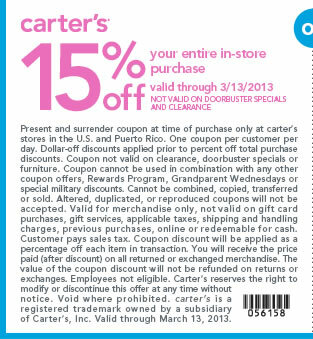 15% Off Any Online Purchase (No Minimum). 50% OFF Everything + Extra 25% OFF $40. 20% Off No Minimum [Exp. 09/30]. 50% OFF Everything + Extra 25% OFF $40 + Free Shipping, and free shipping.. Extra 25% Off $40 + 50% Off Labor Day Sale. Up to 60% Off Site-Wide + 15% Off All Orders with Code (No Minimum). 30% Off Orders Of $60+ [Exp. 08/27]. 30% Off Orders Of $60+ [Exp. 08/24]. 30% Off Orders Of $60+ [Exp. 08/22]. 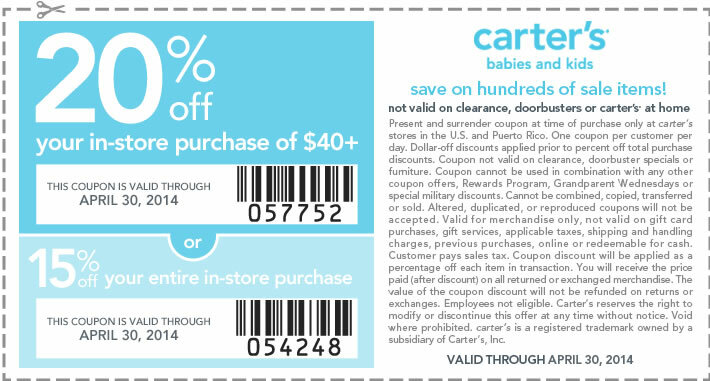 15% off Entire Order or 25% off $40 In-store Printable Carters Coupon [Exp. 08/12] on everything. 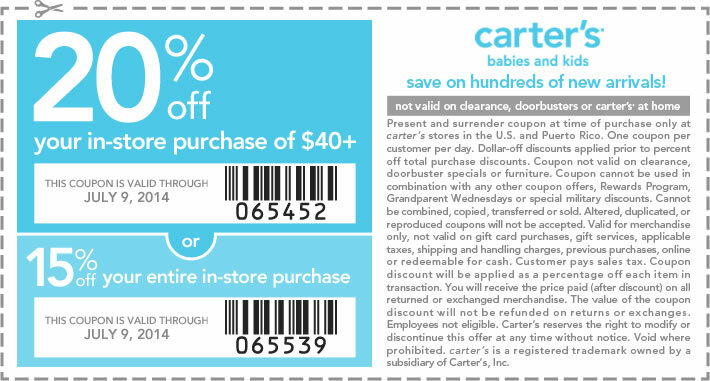 15% off Entire Order or 25% off $40 In-store Printable Carters Coupon [Exp. 08/05] on everything. Up to 50% OFF Sitewide + 25% OFF $40. 40% OFF Everything + Extra 20% OFF $40 Orders. 15% off Entire Order or 20% off $40 In-store Printable Carters Coupon [Exp. 07/29] on everything. 40% OFF Everything + Extra 20% OFF $40. 40% OFF Everything + 20% OFF $40 + Free Shiping. Extra 20% Off $40 Online. Up to 60% OFF Sitewide + 20% OFF $40. 50% OFF Everything + 20% OFF $40 + Free Shipping on $50, and Free Shipping with $50. 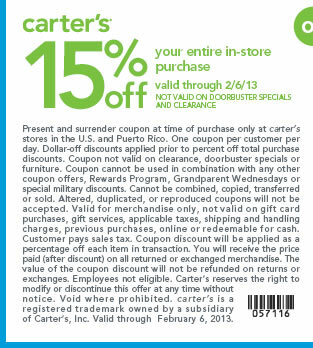 Extra 15% Off (No Minimum) at Carters.com. 50% OFF Everything + 20% OFF $40. 50% OFF on everything, and Free Shipping with $50. 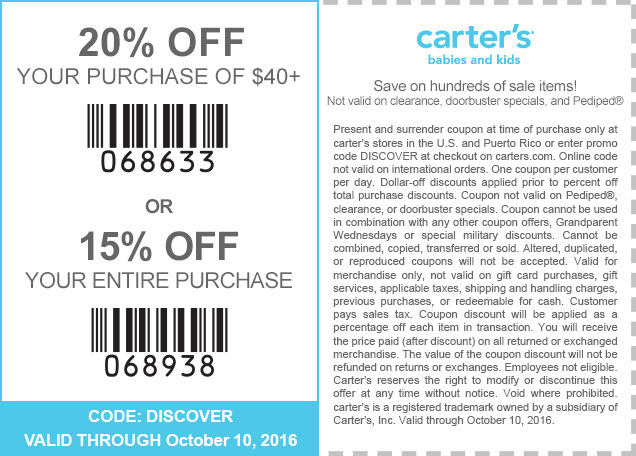 25% Off $50 or More at Carters.com. 25% Off $50+ (Including Sale). 50% Off Cyber Monday Sale + 25% Off $50 Or More. 50% OFF Entire Site + 25% OFF $50+ Purchase on everything. 50% OFF Entire Site + 20% OFF $40+ Purchase on everything. Extra 15% OFF or 20% OFF $40 All Orders (DealAm Exclusive). 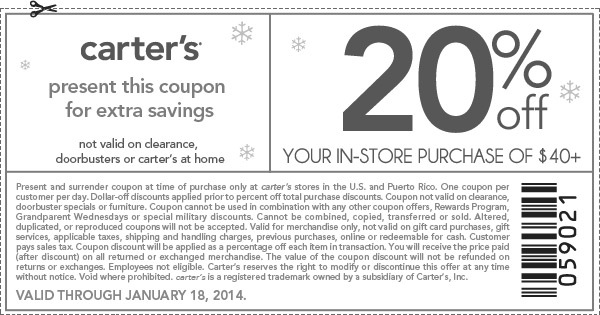 Save 20% on $40 Regular Priced Items Purchase. 25% off $50 on everything, and Free Shipping with $50. 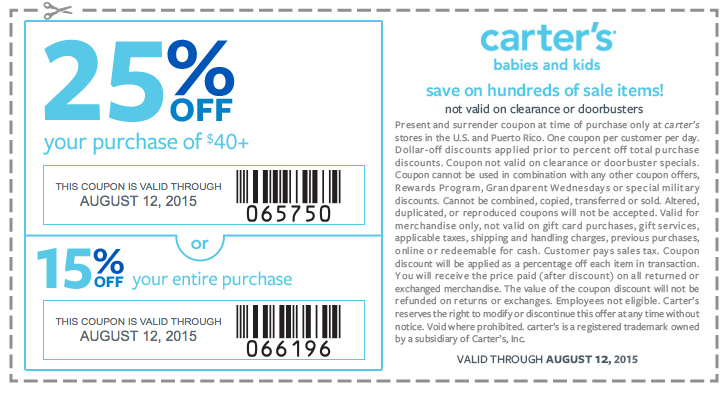 25% Off $40+ | Carter's Labor Day Sale. Save 25% on Select New Arrivals Purchase. Save 25% on New Arrivals Purchase. 15% OFF Entire Site + 20% OFF $40. shimisi shared 9 days ago. s_m1978 shared 1 hour ago. 50% OFF Everything + 25% OFF $50. 40% OFF Everything + 25% OFF $50. shimisi shared 5 hours ago. 25% Off family and friends event on everything. 70% OFF + Extra 25% OFF family and friends event. 50% OFF or More Entire Site & Store + 20% OFF $40. Black Friday Sale: 50% OFF Everything + 20% OFF $40. 20% off, and Free Shipping with $75. Up to 50% OFF Desses + 25% OFF $50. 40% OFF Entire Site & Store + 25% OFF $50. 40% OFF Entire Site & Store + 20% OFF $40. Up to 70% OFF Great Big Sale + 20% OFF $40. 15% Off Any Purchase Or 20% Off $40+ on everything. 15% Off Any Purchase Or 20% Off $40 on everything.